A crazy silent starring Douglas Fairbanks as “Coke Ennyday” courtesy of the blog Old Boy, which is definitely worth your while! The Mystery of the Leaping Fish (1916) is a short film starring Douglas Fairbanks and Bessie Love. In this unusually broad comedy for Fairbanks, the acrobatic leading man plays “Coke Ennyday,” a cocaine-shooting detective parody of Sherlock Holmes given to injecting himself with cocaine from a bandolier of syringes worn across his chest and liberally helping himself to the contents of a hatbox-sized round container of white powder labeled “COCAINE” on his desk. 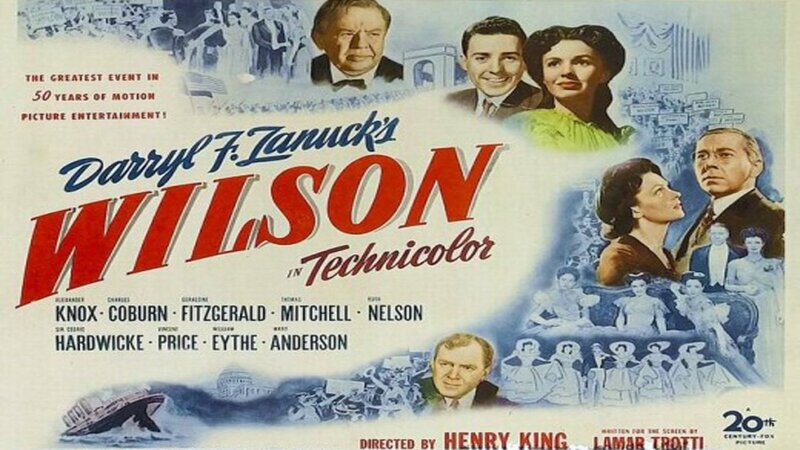 Normally I wouldn’t watch something like WILSON, producer Darryl F. Zanuck ‘s 1944 biographical box office flop about the 28th President of the United States. It didn’t sound like my cup of tea. But when I turned TCM on last night, there was Ben Mankiewicz introducing the film, so I decided I’d watch a little. I ended up watching the whole thing, and while it’s not very exciting, I did get engrossed in the movie, but not for the story. The film itself follows the life and career of Woodrow Wilson, and his rise from President of Princeton University to Governor of New Jersey to U.S. President. How much is truth and how much fiction, I couldn’t tell you. 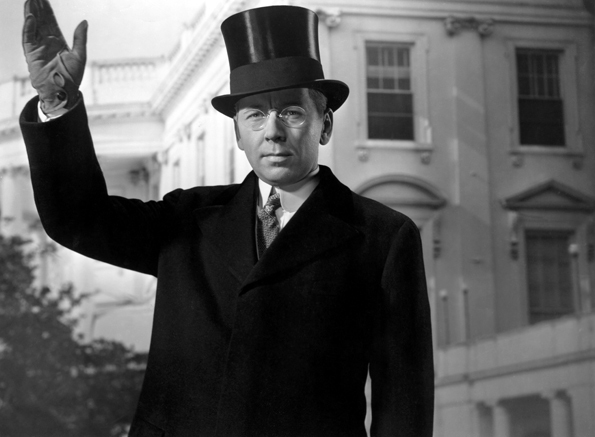 I can tell you that character actor Alexander Knox is a dead ringer for Wilson, and pretty much carries the film with his statesmanlike manner. Ruth Nelson plays first wife Ellen, who dies a tragic movie death, and Geraldine Fitzgerald is quite good as Wilson’s second bride Edith, who takes charge when the president suffers a stroke. The main reason I stayed up to watch WILSON was the marvelous supporting cast of character actors, a veritable Who’s Who of Classic Films! There’s Thomas Mitchell as Wilson’s trusted aide Joe Tumulty, Charles Coburn as economic advisor Dr. Holmes, a very young Vincent Price as Treasury Secretary McAdoo, an almost unrecognizable Sir Cedric Hardwicke as political rival Henry Cabot Lodge, Thurston Hall as Jersey Senator “Big Ed” Jones, Eddie Foy Jr. as Eddie Foy Sr. (who else? ), plus Sidney Blackmer, Three Stooges nemesis Symona Boniface, Francis X. Bushman, Gino Corrado, Marcel Dalio, Francis Ford , Reed Hadley, Charles Halton, John Hamilton, Cy Kendall, George Macready, Edwin Maxwell, Isabel Randolph, Roy Roberts, Dewey Robinson, Ian Wolfe, Will Wright, and a host of other Familiar Faces. Keep a sharp eye peeled for quick cameos from James Cagney and Robert Cummings. I didn’t spot Bess Flowers, but I’m sure she’s in there somewhere! At around the movie’s midpoint, we get vintage newsreel footage of America preparing for World War I (the war to end all wars, remember? ), and history buffs can get glimpses of historical figures like King George V, General Blackjack Pershing, and Teddy Roosevelt, along with silent stars Douglas Fairbanks Sr, Mary Pickford, Marie Dressler, and Al Jolson pitching in for the war effort. So while WILSON the movie didn’t exactly hold my interest, staying up to play “Spot the Classic Stars” certainly did. If you’re a classic movie buff like me, you’ll have yourself a ball! The plot is very simple (and very familiar): a goony gangster (broadly played by a hilarious Edmond O’Brien ) hires a down-on-his-luck agent (Tom Ewell of THE SEVEN YEAR ITCH) to make a singing star out of his honey (our girl Jayne). Only problem is, Jayne can’t carry a tune in a bucket, shattering lightbulbs whenever she starts to warble. Seems she doesn’t want to be a star anyway, just to settle down and be domestic. Tom and Jayne quietly fall in love, the gangster gets jealous, and you just know that by film’s end everything will turn out for the best. Interspersed in all this are the cream of classic 50’s rockers belting out their big ti.. er, hits! Little Richard does the title tune, “Ready Teddy”, and “She’s Got It”. The Three Chuckles (whose lead singer Teddy Randazzo costarred with Tuesday Weld in ROCK ROCK ROCK ) perform “Cinnamon Sinner”. Fats Domino lends his New Orleans-flavored R&B to “Blue Monday”. Gene Vincent blasts his mega-hit “Be-Bop-A-Lula”. Eddie Cochran belts out “Twenty Flight Rock”. Abby Lincoln does a Gospel-tinged “Spread the Word”. The Platters doo-wop to “You’ll Never, Never Know”, and Nino Tempo, Johnny Olenn, Eddie Fontaine, The Treniers, and Freddy Bell & The Bell-Boys also appear. Tashlin’s trademark cartoony gags bounce playfully throughout the film, beginning right off the bat with the pre-credits introduction by Ewell. It’s packed with double entendres by the truckload, most of them involving Jayne’s ample endowments. There’s a funny fantasy scene where Ewell, still carrying the torch for ex-client Julie London, sees her everywhere singing her own big hit, “Cry Me A River” (and by the way, the future Nurse Dixie McCall of TV’s EMERGENCY was pretty darn hot herself!). Surpassing that is the sight of O’Brien gyrating wildly and croaking out the song “Rock Around the Rock Pile”, a precursor of sorts to Elvis Presley’s showstopping number in JAILHOUSE ROCK . Despite the classic rockers, Tashlin’s Looney Tunes humor, and a beautiful pastel color scheme, all eyes will be on Jayne Mansfield. She’s really good in this, giving a sweet-natured performance as the girl who just can’t help it. Jayne was red-hot at the time due to her Broadway smash WILL SUCCESS SPOIL ROCK HUNTER? (later filmed by Tashlin), and 20th Century Fox signed her as a rival to Marilyn Monroe. She was a good actress, though now best remembered for her sexpot image, and it’s a shame her career took such a downward trajectory so fast. With the right material, we’d probably be looking at Jayne Mansfield today for more than her obvious assets. Legend has it when THE GIRL CAN’T HELP IT was released in England, a 16-year-old kid in Liverpool saw his rock idols perform for the first time. The lad’s name was John Lennon, and soon he met 15-year-old Paul McCartney, who auditioned for Lennon’s teenage band by doing an imitation of Eddie Cochran’s “Twenty Flight Rock” from the film. McCartney got the gig, and within a few years The Beatles were the biggest rock’n’roll band in the world. 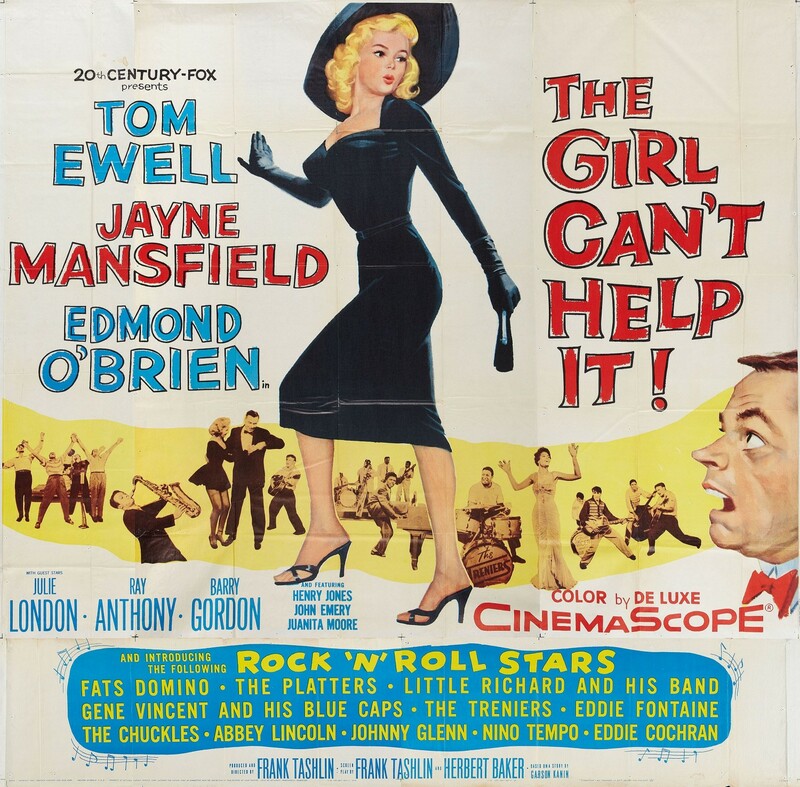 That’s how influential THE GIRL CAN’T HELP IT was in the history of rock’n’roll, and any fan of rock music, Jayne Mansfield, or Frank Tashlin needs to put it on their must-see list. G’day, mates! 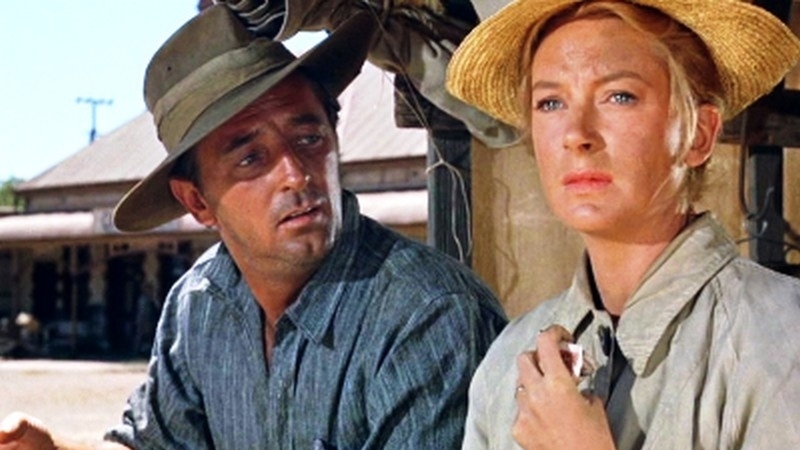 Let’s take a trek through the wilds of 1920’s Australian outback with , Robert Mitchum Deborah Kerr, and a herd of bouncing sheep in THE SUNDOWNERS. 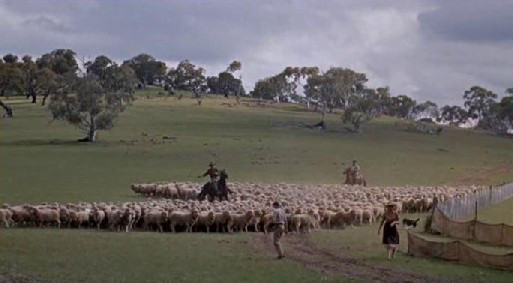 Fred Zinnemann, generally associated with serious, tense dramas like HIGH NOON and FROM HERE TO ETERNITY, lends a lighter touch than usual to this sprawling, almost John Ford-esque tale of an itinerant sheep drover and his family, and the wife who longs to settle into a home of her own. Mitchum plays Paddy Carmody, a stubborn Irishman who has to keep moving, unable and unwilling to be tied to one place. He’s a wanderer with a fondness for booze and gambling, and Big Bob is perfect for the part. 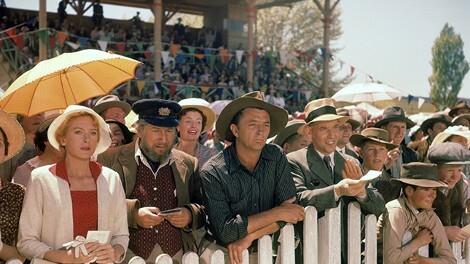 Mitchum’s penchant for dialects make his Aussie accent more than believable, and his facial expressions, especially during the sheep-shearing contest, are priceless. Deborah Kerr is his equal as wife Ida, the tough Earth Mother who’s loyal to Paddy but forever dreaming of a permanent home for them and son Sean (Michael Anderson Jr.). As good as Mitchum is, Kerr’s the heart of the film, and she was Oscar nominated for this performance, losing out to Liz Taylor in BUTTERFIELD 8. Peter Ustinov joins them along the way as Briton Rupert Venneker, like Paddy a wandering soul, who becomes attached to the Carmodys. Ustinov, as always, shines in the supporting role of the vagabond Englishman, who meets a match of his own in chatty hotelier Mrs. Firth (Glynis Johns, who was also Oscar-nominated). Dina Merrill and Chips Rafferty are among the supporting cast, as are a number of less well-known Australian actors. The colorful, scenic cinematography is by Jack Hildyard, who won an Oscar for BRIDGE ON THE RIVER KWAI, and whose work can be seen in HENRY V, CAESAR AND CLEOPATRA, THE VIP’S, and MODESTY BLAISE . Hildyard captures the hardscrabble back country wilderness with a keen eye, and kangaroos, koalas, and dingos pop up everywhere. The deadly forest fire scene is a highlight, as is the horserace later in the film. The delightful visuals are set to a marvelous Dimitri Tiomkin score. THE SUNDOWNERS gathered five Oscar nominations in all, including Best Picture, Director, and Adapted Screenplay (Isobel Lennert ). It did not win any; in fact, the film did poorly here in the U.S., although it was a hit in Britain and Australia. It was only later, in part because of exposure through television, that it has come to be appreciated by many fans, including Yours Truly. 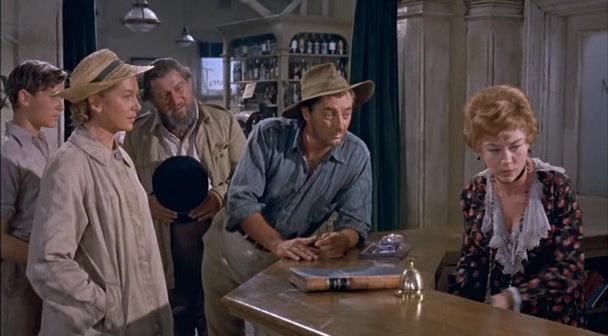 It’s a warm, family oriented comedy-drama with beautiful location photography and top-notch performances by Mitchum, Kerr, and Ustinov. 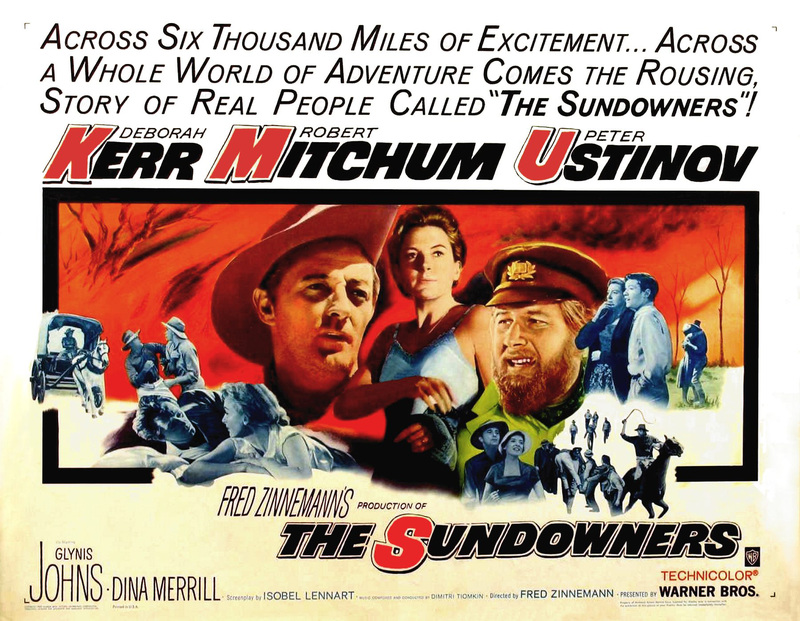 Fred Zinnemann made some of cinema’s finest films about the human condition, and THE SUNDOWNERS is one of them. It’s lighthearted tone is what probably keeps the cognoscenti from ranking it higher in Zinnemann’s body of work; to me, it’s worth reappraisal. Wanger hired Don Siegel to direct the film. 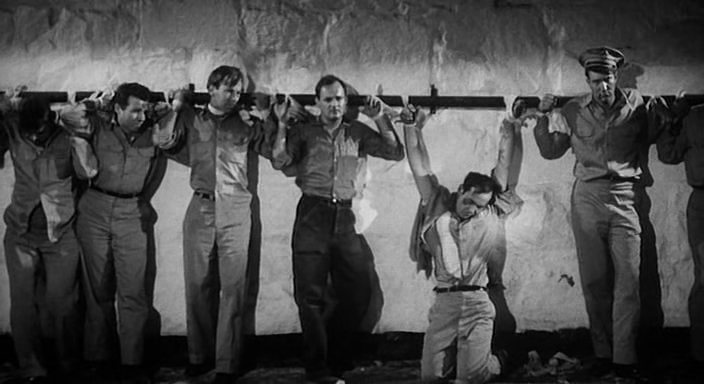 Siegel was gaining a reputation as a director of muscular, low-budget features, and RIOT IN CELL BLOCK 11 is a great early example of his harsh, brutal style. 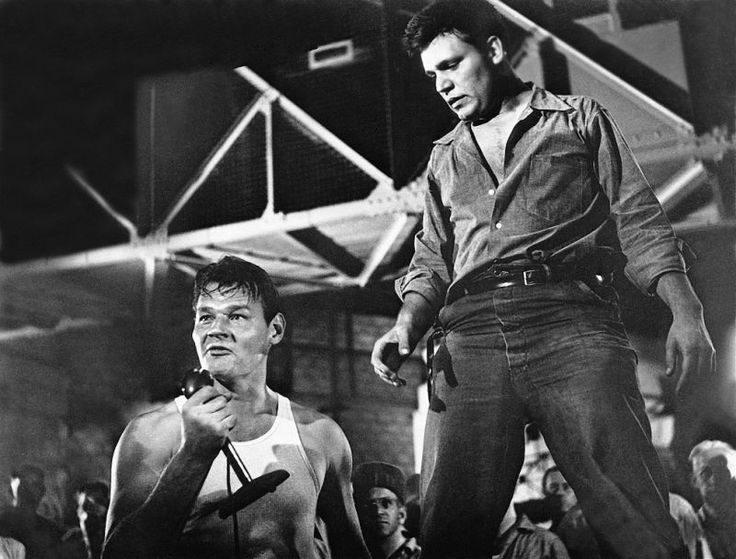 The movie’s sparse, shadowy setting was filmed on location at California’s infamous Folsom Prison thanks to the connections of one of Siegel’s assistants, a young man working on his first film named Sam Peckinpah . Gee, I wonder whatever became of him? 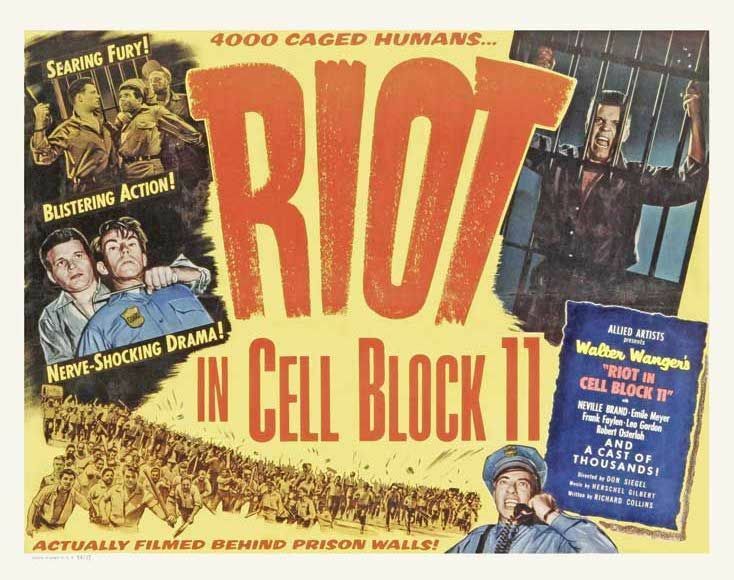 RIOT IN CELL BLOCK 11 opens with narrator James Matthews intoning ominous newsreel footage of prison riots across the USA protesting inhumane conditions. We then turn to our fictional prison, where a single mistake by a rookie guard leads to chaos in Cell Block 11, led by hardened cons Dunn (Neville Brand ) and Carnie (Leo Gordon). They take over the solitary confinement block, using four guards as hostages, and trash the place. The warden (Emile Meyer) is called in as the inmates present their demands, and insist the press be alerted as well. The entire prison devolves into chaos and rioting, and the state police are called in to quell things with smoke bombs and rubber bullets. An inmate is accidentally killed during the commotion, and five other guards are snatched by the cons. 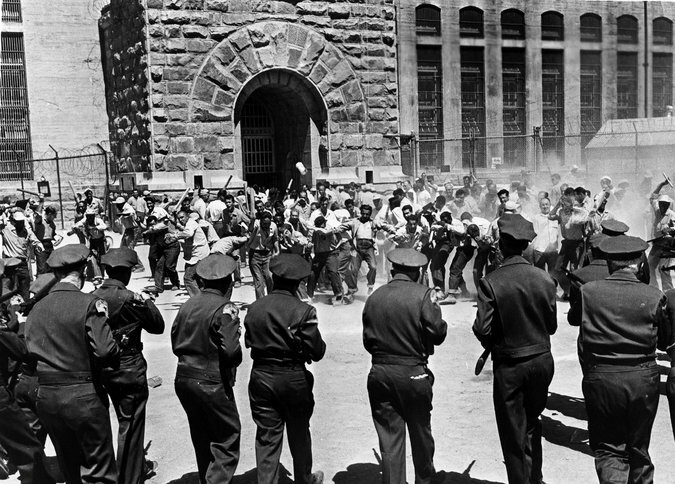 The warden hears Dunn’s demands: remodel the condemned solitary block, separate “the nuts” (those with mental health issues) from the other cons, get rid of leglocks and overzealous guards, teach the men a trade, and absolutely no reprisals for the rioters. The warden has been asking for some of these same changes for years, but his pleas have fallen on deaf ears. He’s willing to sign off on them now, but the governor (Thomas Henry Browne) refuses, and the prison commissioner (Frank Faylen) orders TNT to be planted on the outside wall of the cell block. Meanwhile, warring factions in the cell block leave Dunn injured, and his lieutenant “Crazy Mike” Carnie takes command. Carnie plans to begin killing hostages, but when the commissioner’s plot is discovered, they chain the hostages to a pipe on the other side of the wall. Dunn recuperates just in time to take a phone call from the warden: the governor has relented, and the prisoner’s demands for change will be met. But two weeks later, it turns out it was all for naught. The state legislature repudiates the warden’s and governor’s signatures, and Dunn is to stand trial for leading a riot and kidnapping the guards. Though Carnie and some of the other “nuts” are sent to the State Mental Institution, the rest of the demands will not be met. The cast of RIOT IN CELL BLOCK 11 consists of some legitimate hard guys. Neville Brand was a highly decorated soldier during World War II, earning a Purple Heart, Silver Star, three Bronze Stars, and six other medals for bravery and valor in combat. Leo Gordon was thrown out of the Army, and later served five years in San Quentin for armed robbery. 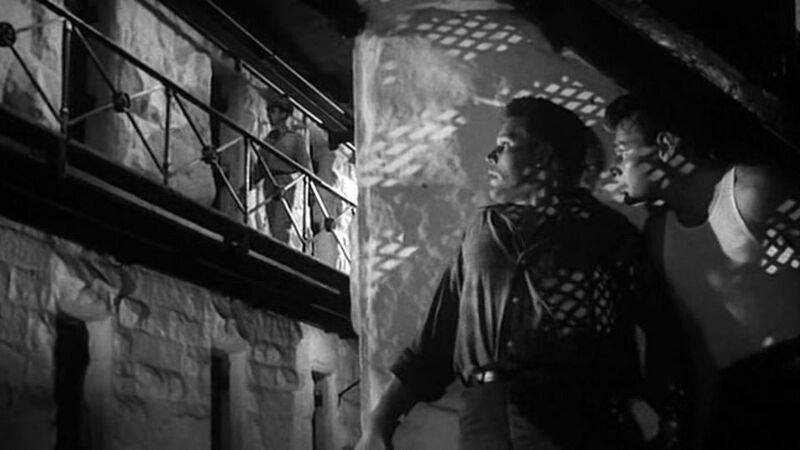 The warden of Folsom reused to let Gordon in at first, but Siegel, who once called Gordon “the scariest man I have ever met”, talked him into it. Among the cons, guards, and reporters, you’ll find Familiar Faces like Whit Bissell (whose first credited role was in BRUTE FORCE ), Roy Glenn, Dabbs Greer (whose final film appearance was in THE GREEN MILE), Frank Hagney, Jonathan Hole, Alvy Moore , William Phipps, William Schallert , and Carleton Young. Some of the actual Folsom cons and guards appear as extras. RIOT IN CELL BLOCK 11 tells a very bleak tale of desperate people driven to desperate measures. 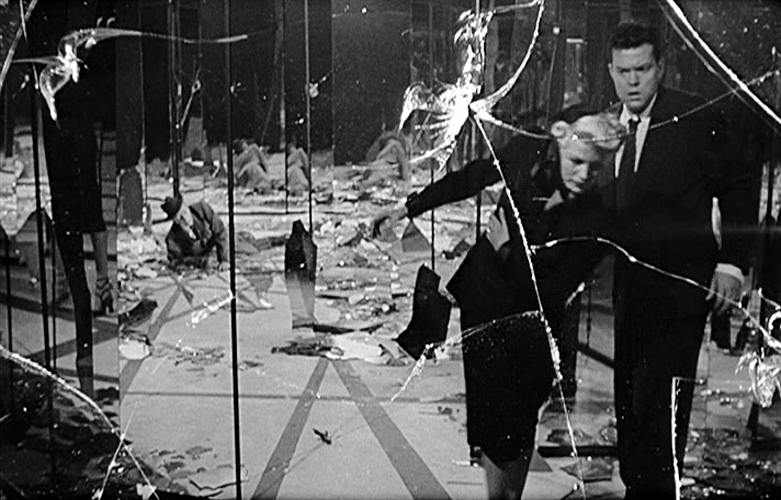 It’s lean and mean, like the best films noir, and delivers it’s message with sledgehammer potency. This compact diamond-in-the-rough is among director Siegel’s best work, and is highly recommended by yours truly. “Johnny B. Goode”. “Roll Over, Beethoven”. “Sweet Little Sixteen”. “Rock and Roll Music”. 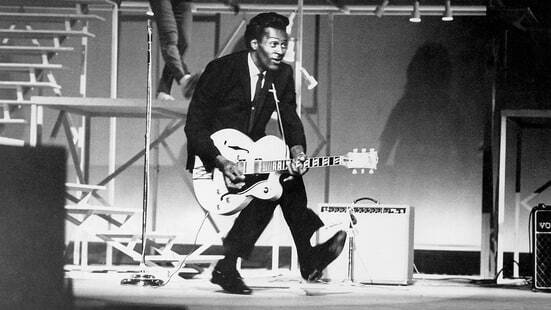 The most iconic songs of the Golden Age of Rock’N’Roll belonged to one man, Chuck Berry. When I got home this evening and heard the news he passed away at the age of 90, I knew I’d have to preempt my regularly scheduled post and pay tribute. Because without Chuck Berry, there’s no Beatles, no Rolling Stones, no Beach Boys, no rock and roll as we know it. He was that influential on 20th century music, and the uncrowned King of Rock and Roll. Sure, Elvis was bigger, but it was Chuck Berry who wrote the soundtrack for a generation of kids listening to their radios searching for relief from the blandness of 50’s commercial pop. He spoke their language, the language of teenage lust, hot rods, high schools hops, all set to a rocking back beat. Berry was influenced by the jump blues of Louis Jordan and the electric blues of T-Bone Walker, the western swing of Bob Wills and the soulful singing of Nat King Cole, added his own “duck walking” brand of showmanship, all propelled by Johnnie Johnson’s honky-tonk piano, and created something totally unique. He called it rock and roll. Chuck was no saint. Far from it. As a teen, he did time in a reformatory for armed robbery and car theft. He was found guilty of violating the Mann Act for crossing state lines with a 14-year-old waitress, got sued for installing a camera in the ladies room at his restaurant, did four months for tax evasion, and was busted for possession of weed. Chuck Berry was rock and roll’s real bad boy, and a notoriously cranky curmudgeon, but his fans remained ever loyal despite his flaws. They knew his talent outweighed all his faults. The 1987 rock doc HAIL! HAIL! ROCK’N’ROLL a 60th birthday concert filmed by Taylor Hackford featuring a veritable Who’s Who of classic rockers joining Chuck onstage. There was Eric Clapton, Bo Diddley, Keith Richards, Bruce Springsteen, and more celebrating the music of their idol. Earlier this year, on Chuck’s 90th birthday, it was announced he would be releasing his first new recording in 38 years, “Chuck”. I for one am eagerly awaiting it’s release. Continuing today’s salute to St. Patrick and all things Irish, how about Mrs. Kelly’s baby boy Gene dancing up a storm to “The Hat Me Dear Old Father Wore” from the 1949 musical TAKE ME OUT TO THE BALL GAME (which you can read about here). Does it get anymore Irish than this?